Experience the best of Southern Oregon and Northern California on this tour of superlative natural wonders in late June 2018. Start your river trip on the gently flowing waters of the Rogue. Breathe deeply and take in the fragrant air from the surrounding forest of pine, oak, and madrone. 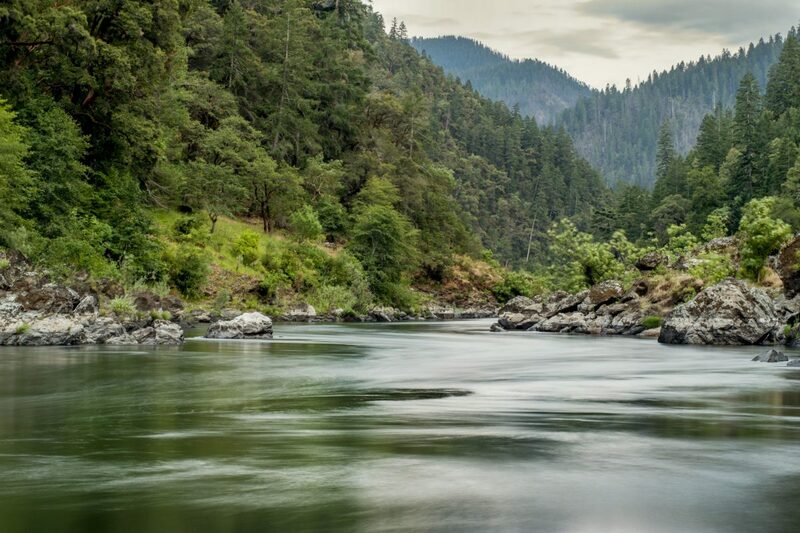 The Rogue River flows from the Oregon Cascade Mountains to the Pacific Ocean and your journey follows the river through the Rogue River Wilderness section. Never rafted? No problem! Professional rafting guides will show you all the tips you’ll need as you float and paddle down the Class II-IV rapids of the Rogue. This trip is especially unique as you get to experience a wilderness river, its solitude and remoteness, yet enjoy comfortable lodge accommodations in the evening, such as Morrison's Rogue River Lodge. Meet Ginger Johnson, TED speaker, beer craft expert, and entrepreneur! She will join you on the river, hosting you on delicious evening tastings with food pairings. Medford, Oregon is one of the few regions in the US where Tempranillo and Viognier grapes can be grown. Drive along the famous US Route 101. Views of the Pacific Ocean abound as the highway follows the coast and crosses into northern California. Redwood Trees are one of the tallest trees in the world, and they only grow in this region of the Pacific Coast. These tall graceful trees will remind you of the resilience and depth of nature. Boy Scout Tree Trail hike is 5.3 miles and has 750 feet of elevation gain. The hike will take you through a variety of ecosystems and numerous stands of tall trees. There are plenty of places to stop along the trail and take in the immense trees. Take a short walk to a spectacular viewing of the Crescent City 4th of July Firework show - one of the biggest displays on the north coast. Drive to Oregon Caves National Monument. Oregon Caves was declared a National Monument by President William Howard Taft in 1909. Tour the caves with a ranger and learn about their formation and history. Take some time to explore these remarkable caverns. Deep in the Siskiyou Mountains, Oregon Caves National Monuments caves formed when acidic rainwater dissolved the surrounding marble, creating one of the few marble caves in the world. After your tour inside the caves, explore outside where the Monument’s ancient forests contain endemic Port Orford Cedar and one of the largest Douglas-fir trees in Oregon. Crater Lake National Park is a magical place that has inspired people for hundreds of years. Explore Crater Lake by driving around the rim and taking a short hike. Hike to discover The Pinnacles. An amazing place to relax and reflect, on the deck of the lodge overlooking the lake. Experience the best of Southern Oregon and Northern California in late June 2018 on this adventure tour featuring superlative natural wonders from the Rogue River and Redwood National Forest, to Crater Lake National Park. Begin in Medford, the hub of southern Oregon and an area known for its rich and fertile landscapes. Did you know that Medford is one of the few regions in the U.S. where Tempranillo and Viognier grapes can be grown? Besides Oregon’s world class wineries, this part of the country is a great place to explore the best of the Pacific Northwest, from the Siskiyou Mountains to the Pacific coast. 2018 is the 50th anniversary of the Wild and Scenic Rivers Act – what better way to celebrate than a rafting trip on one of the original rivers named in this act? The peaceful Rogue River flows from the Oregon Cascade Mountains to the Pacific Ocean and your river rafting trip follows the river through the Rogue River Wilderness section. This trip is especially unique as you get to experience a wilderness river, its solitude and remoteness, yet enjoy comfortable lodge accommodations in the evening. Never rafted? No problem! Professional rafting guides will show you all the tips you’ll need as you float and paddle down the Class II-IV rapids of the Rogue. Rafting is an exciting and exhilarating experience that will leave you feeling fulfilled and triumphant – it’s an AdventureWomen favorite! Ginger Johnson, author, TED speaker, educator and coach (and renowned craft beer expert) will join you on the river, hosting you on delicious evening tastings with food pairing while infusing her energy and passion for “the two fundamentals in life – women and beer” to add to your rafting fun. Explore the Rogue River Ranch. Stretch your legs a bit and learn about the early settlers who built this ranch. The classic Oregon guest ranch has been restored and is open for Rogue River visitors to learn and experience what early pioneer life was like. As you make your way downstream on the Rogue River by paddle, breathe deeply and take in the fragrant air from the surrounding forest of pine, oak, and madrone. Each day, stop to enjoy a bountiful riverside lunch, then continue paddling through more rapids, and into the calm pools and “eddies” between them, or cool off as you jump in for a swim! We continue our journey in Oregon driving south along the famous US Route 101. Views of the Pacific Ocean abound as the highway follows the coast and crosses into Northern California. Redwood trees are one of the tallest trees in the world, and they only grow in this region of the Pacific Coast. These majestic beauties can grow from a seedling to over 100 feet tall in less than 50 years and remind us of the resilience and depth of nature. You’ll spend a day hiking along the Boy Scout Tree Trail, which is 5.3 miles and has 750 feet of elevation gain. This hike will take you through a variety of ecosystems and numerous stands of tall trees. There are plenty of places to stop along the trail and relax as we soak in the sounds and sights of the Northern California backcountry. Deep in the Siskiyou Mountains, Oregon Caves National Monument is home to natural caves formed when acidic rainwater dissolved the surrounding marble, creating one of the few marble caves in the world. Tour the caves with a ranger and learn about their formation and history taking some time to explore these remarkable caverns! Head next to Crater Lake National Park, a magical place that has inspired people for hundreds of years. There is no place else on earth that combines a deep, pure lake so blue in color, sheer surrounding cliffs almost two thousand feet high, two picturesque islands, and a violent volcanic past. Crater Lake is a place of immeasurable beauty. There are no rivers that either feed or drain Crater Lake – the water in the lake is lost due to evaporation and is replaced by snow melt and rain. It takes approximately 250 years to replace all the water in the lake. Join us in June for a wilderness trip into the forests, rivers and ecosystems of Southern Oregon and Northern California to rediscover the pioneer spirit inside all of us. Medford is the hub of southern Oregon, an area known for its rich and fertile landscape. Medford is one of the few regions in the US where Tempranillo and Viognier grapes can be grown. Besides its world class wineries, this is a great place to kick off any adventure exploring Southern Oregon and Northern California, from the Siskiyou mountains to the Pacific coast. Your guides will meet you at the Rogue Valley International-Medford Airport (MFR) at 5:00pm and transfer you to your river-side lodge. If you arrive earlier please feel free to explore Medford. Visit one of the local winery tasting rooms or just take a stroll along the river. Get to know your AdventureWomen group at your Welcome Dinner! After dinner, your guides will give you a short orientation about the trip as well as the river rafting portion that begins the following day. At this meeting, guides will explain what you can bring on the river and how to pack it in the provided bags, as well as what to do with your other luggage. Morrison’s Rogue River Lodge is located 16 miles downstream from Grants Pass along the banks of the famed Rogue River. The historic log lodge and individual cabins, half-hidden by groves of evergreen, maple, and oak, are a peaceful refuge from the hectic, everyday world. 2018 is the 50th anniversary of the Wild and Scenic Rivers Act – what better way to celebrate than a rafting trip on one of the original rivers named in this act? The Rogue River flows from the Oregon Cascade Mountains to the Pacific Ocean and your journey follows the river through the Rogue River Wilderness section. This trip is especially unique as you get to experience a wilderness river, its solitude and remoteness, yet enjoy comfortable lodge accommodations in the evening. Drive to the put-in point, where you will be given a through safety orientation, fitted with a personal floatation device, and introduced to the other rafting guides. Start your river trip on the gently flowing waters of the Rogue. Breathe deeply and take in the fragrant air from the surrounding forest of pine, oak, and madrone. After a few miles, you will come to your first frolicking rapids. After a bountiful riverside lunch, continue down the Rogue River through more rapids, and in the calm pools between them, jump in for a swim. Arrive at your comfortable riverside lodge accommodations late this afternoon. Clean up before joining the guides for appetizers and dinner. Enjoy your stay in rustic log cabins situated among the forest on privately owned wilderness property. Share family style meals of all-you-can-eat home- style cooking. After a long day floating the Rapids, the hot showers and comfortable beds will provide a nice nights sleep. Another fun day of rafting on the Rogue river awaits you. Today’s adventure will highlight some of the early pioneers and who settled this rugged part of Oregon. The Rogue river is one of two locations in the US that still has a United States Postal Service Mail Boat to deliver mail to the residents of the canyon. Coffee and tea will be served in the dining room at 7:00am followed by a hearty breakfast at 7:30. After breakfast, have a leisurely morning packing up before heading back to your boats for a morning of rafting. Rapids today are Class II-III and a great warm up for the more technical rapids tomorrow. After a riverside lunch, float to the Rogue River Ranch. Stretch your legs a bit and learn about the early settlers who built this ranch. The ranch has been restored and is open for river passengers to visit and explore what early pioneer life was like. Arrive at your lodge late this afternoon and relax after an exciting day on the river. Enjoy a comfortable night’s rest in this rustic and remote lodge that has always been known for its old fashioned family hospitality. Enjoy your final day on the river – take a short hike or swim in the pools. Make sure to soak it all in. In the afternoon, transfer down the coast on the famous Highway 101. Today includes some of the most challenging rapids on the Rogue, including Mule Creek Canyon, Blossom Bar, and Devils Staircase. Enjoy one last riverside lunch before arriving at the take out point. Change clothes and head off in your private vans. Drive along the famous US Route 101. Views of the Pacific Ocean abound as the highway follows the coast and crosses into northern California. Your drive to Crescent City takes approximately three hours. Enjoy dinner at a local restaurant. After dinner, take a stroll along Crescent City’s B Street Pier. The Pier is 900 feet long and offers a breathtaking view of the ocean and the bay. The stunning beauty of California’s Redwood Coast is only steps away from your hotel in Crescent City. Enjoy a comfortable stay with modern conveniences like plush beds, free Wi-Fi, spacious work desks, and flat screen televisions with premium cable. The hotel is perfectly located just steps from the harbor and downtown shops. Redwood Trees are one of the tallest trees in the world, and they only grow in this region of the Pacific Coast. They can grow from a seedling to over 100 feet tall in less than 50 years. What better way to spend the 4th of July than standing amongst giants, many of which have been around since before the first Independence Day. After breakfast at the hotel, begin the day with a short drive to the Redwoods National and State Park Visitor center. Learn more about the area and the life cycle of these magnificent trees during a short visit to the visitor center. A short drive brings you to the trailhead for the day. After a safety briefing, begin the hike. Boy Scout Tree Trail hike is 5.3 miles and has 750 feet of elevation gain. The hike will take you through a variety of ecosystems and numerous stands of tall trees. There are plenty of places to stop along the trail and take in the immense trees. Enjoy a picnic lunch along the trail prepared by the guides. Return back to your hotel in Crescent City. Relax at the hotel or explore town. If the tides line up, take a visit to the 150 year old Battery Point Lighthouse that is only accessible at low tide. Have an early dinner this evening. The restaurant is well known for its local seafood options. After dinner, a short walk takes you to a spectacular viewing of the Crescent City 4th of July Firework show – one of the biggest displays on the north coast. Deep in the Siskiyou Mountains, Oregon Caves National Monuments caves formed when acidic rainwater dissolved the surrounding marble, creating one of the few marble caves in the world. Oregon Caves was declared a National Monument by President William Howard Taft in 1909. Drive to Oregon Caves National Monument. Tour the caves with a ranger and learn about their formation and history. Take some time to explore these remarkable caverns. After your tour inside the caves, explore outside where the Monument’s ancient forests contain endemic Port Orford Cedar and one of the largest Douglas-fir trees in Oregon. Enjoy a picnic lunch. Drive the final two and a half hours to Crater Lake National Park. When you arrive, check in at the historic Crater Lake Lodge, perched on the rim of the lake and originally built in 1915. After settling into your room, meet for dinner in the famous lodge dining hall. Originally opened in 1915, the historic Crater Lake Lodge welcomes you with a boldly stated fireplace in the Great Hall. Following extensive renovations in 1995, the lodge also offers an atmosphere reminiscent of the 1920s and immerses visitors in its rustic charm. Each room provides the ideal hotel standards of comfort and privacy in the heart of Crater Lake National Park. Crater Lake National Park is a magical place that has inspired people for hundreds of years. There is no place else on earth that combines a deep, pure lake so blue in color, sheer surrounding cliffs almost two thousand feet high, two picturesque islands, and a violent volcanic past. It is a place of immeasurable beauty. There are no rivers that either feed or drain Crater Lake – the water in the lake is lost due to evaporation and is replaced by snow melt and rain. It takes approximately 250 years to replace all the water in the lake. After breakfast at the lodge, start exploring Crater Lake. Begin by driving around the rim and taking a short hike. The exact hike location will be determined on the trip and based on trail availability and group interest. Some possibilities are Discovery Point or The Pinnacles. Join a ranger-led boat tour of the lake. Learn about the geology, cultural importance, and the history of the deepest lake in the United States. The boat tour starts from the bottom of the Cleetwood Trail which is a 2.2 mile round trip trail that gains 700 feet in elevation. Enjoy another bountiful picnic lunch during today’s adventure. Enjoy one last morning as a group before heading home. Arrive: Arrive Rogue Valley International – Medford Airport (MFR) on June 30, 2018 before 5:00pm. Depart: Depart Rogue Valley International – Medford Airport (MFR) on July 7, 2018 after noon. We rate this trip as moderate. You should be able to hike up to five miles on fairly steep terrain with elevation gain of 1,000 feet. We have a partnership with FitForTrips, a company that will design an individualized fitness plan for you to ensure that you are prepared for the trip. Visit https://fitfortrips.com/partners/adventure-women/ for more information. Cash and credit cards are the preferred method of payment where needed. There will be limited access to ATMs in the remote locations in which you will be. Rogue River Lodge Staff – If you feel that you have been well served, we recommend a $5 per guest gratuity be given to the staff after break- fast each morning. Final payment is due to AdventureWomen in a cash form (check, money order, or wire transfer) on or before April 1, 2018. Weather in the Pacific Northwest can vary widely day to day. Typical daytime temperatures can climb into the 70s and 80s, with the water temperature at generally 50-60 degrees. Crater Lake National Park has its own climate - you can expect the max day time temperature to be in the mid 50s in early July. Make sure you pack some additional warm clothes for this part of the trip. In the evening temperatures can drop down into the 30s, and as star gazing is spectacular at Crater Lake you will want to make sure you have a jacket! Weather in the Northwest is unpredictable. You must come prepared for cold/wet weather and hot/sunny weather – sometimes even in the same day! The following information will help you be prepared for the expected as well as the unexpected events of your trip. You may not end up using all of the gear listed below, but we recommend bringing it all. Clothing layers are your thermostat in the outdoors - think about dressing in layers. All of your on-river clothing should be made from synthetic fabrics like fleece, pile, polypropylene, Capilene™, or polyester. Quick-dry clothing works well on the river or the trail. A light cotton button down shirt or t-shirt can be used on hot, sunny days, but cotton clothing is best saved for at the lodges and town. For the river rafting portion of the trip, your luggage will be limited to 25lbs, and you will be provided with a waterproof bag. The rest of your luggage will be transported to meet you at the end of the rafting portion. 1 pair water shoes or sandals/sneakers that can get wet. Many of the same items from the river can be used. In addition, we recommend the following items. What guests are saying "Pacific Northwest: Redwoods, River Rafting, & Crater Lake"
"First trip with Adventure Women to Pacific Northwest was wonderful. Well organized, exceptional guides, great food, very good itinerary. Nice to be able to just show up and everything is taken care, allowing guests to just have fun. Kudos for ambassador, Eliza and trainee, Katie! Plan to travel with Adventure Women again."